You have to hand it to Amazon. Instead of tackling the almighty iPad head on, the company bravely introduced a device that, while not necessarily wowing on specs or features, made an enormous impression with its bottom-dollar price. The impact is still being felt, and the industry hasn't been the same since.Twelve months on, and the company has learned a few important lessons. No longer can it just offer a $200 device, not with the Nexus 7 around; it has to make something that truly stands out — take the best aspects of the original Kindle Fireand make them twice as good. Here's a tablet that's wonderful to hold and use, but marred by a few silly flaws. With an 8.9-inch screen that's not really too big and not really too small, it's one darn comfortable device to hold. 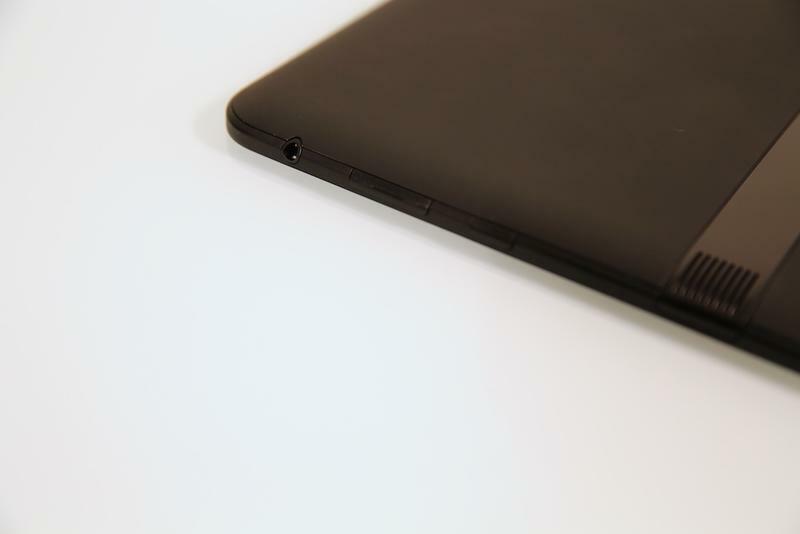 It's fantastically thin — more so than an iPad — inside an equally light (but very solid) package. 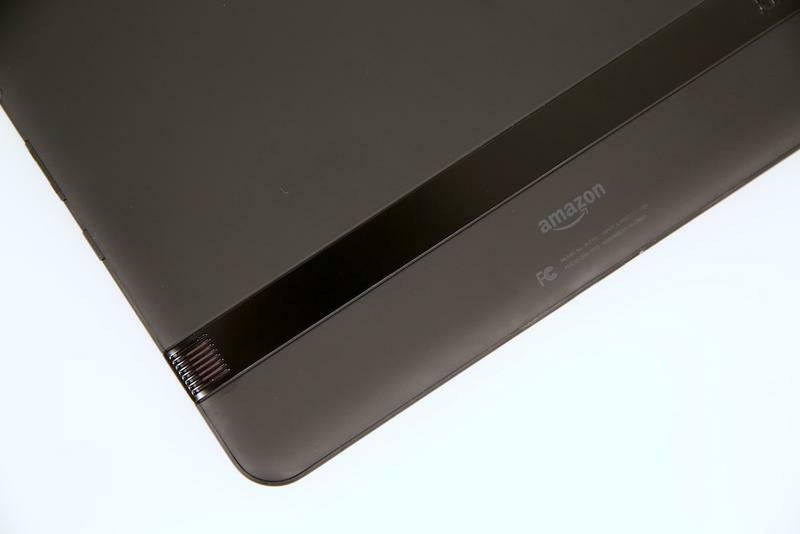 Picking it up, it's immediately apparent just how carefully Amazon crafted the device together, using a strong rubberized material accented with a strip of plastic across the back. Holding it with two hands is no problem, and it's not really an issue one-handed either, like if you're reading a book while holding the tablet in portrait. Everything is nice and clean, and worlds better than what last year's Kindle Fire, that's for sure. When you hold the 8.9-inch Fire HD, you want to keep on holding it and turning it over and sweeping your hands across the back and screen and sides. You'll turn it over and inspect its rounded back and flat edges. My thumbs fit perfectly inside the bezel, which isn't all that big for a larger-sized tab. It sure doesn't feel like a $300 product — there's a craftsmanship that you can tell runs deep through every last inch, and it feels premium. And that all makes consuming content, the device's central purpose, easy and wonderful and addicting. If you're new to Amazon's ecosystem, actually building up a library is a bit intimidating. When you first turn the device on the carousel is empty and lonely, but this is where everything you watch and own and read lives. There is a plain but simple navigation bar up top — shop, games, apps, music and videos are listed here — where you can access specific content in your library. If nothing's there, tap the Store button, which is present in nearly every avenue of the device, and you'll quickly learn just how massive Amazon's ecosystem is — it really never ends. Never. Ends. Everything is presented in a way that funnels users down a path with a dead end to videos, or books or apps. That's exactly how Amazon wants it. Just as the company did in the original Fire, Amazon has designed a platform built on Android — Android 4.0 this time instead of version 2.3 (Gingerbread) — that's a smooth enough experience. You don't get the fluidity and snap of Jelly Bean, but there's a noticeable step up from the previous Fire, as there should be. Pretty much every video and book is available to watch and read. There were some instances I couldn't find exactly what I was looking for, but I'll give Amazon a pass because they were admittedly a bit obscure. Otherwise, there are books, albums and movies (especially current ones) aplenty. The device's purpose, after all, is to consume media. That's particularly true if you have a Prime membership, which offers up a lot of great content for free. You can't beat that. For a lump annual sum of $79, it isn't a bad bargain at all. Let's, for a moment, judge this on hardware alone — Amazon should be very proud of what its engineers have created. The company is primarily known for its ecosystem, and not necessarily for creating desirable hardware. I think, though, we've seen a different side of the company this year, starting with a pretty great Paperwhite, 7-inch Fire HD and now the 8.9-inch HD. The addition of MIMO dual-antenna tech is a nice touch, as are the dual Dolby speakers. The only slight knock against the design is how both the volume rocker and power button are implemented, which both rest on the tablet's right side. It can be difficult to find; you'll constantly find yourself sweeping your finger across the tablet's sides — back and forth, back and forth — when you want to sleep or wake the device. Finally, the screen, while behind the iPad and Nexus 10 in overall pixels per inch (ppi(, is lovely and great. HD movies look wonderful, and the text in books and on Web pages is crisp and easy to read. 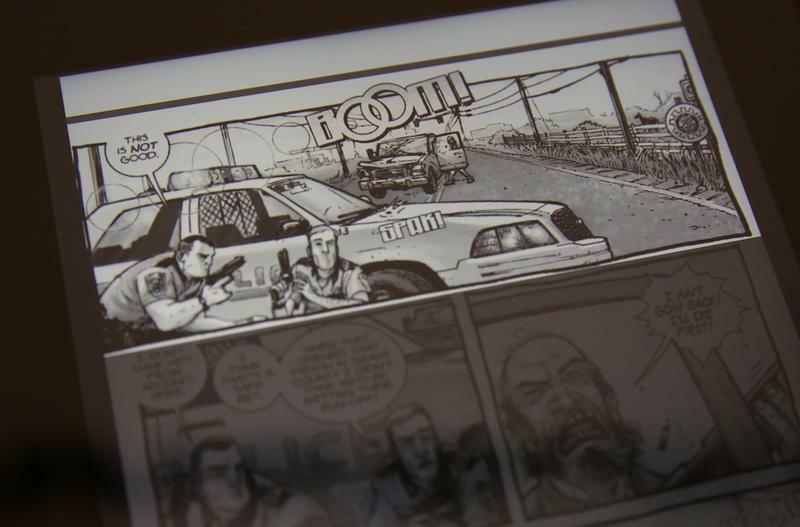 Likewise, comics look pretty fantastic in full screen here, and text is pretty easy to make out; nothing is too small, and the sharp display really makes the art pop. It's all very comfortable and pleasant. When you hold the 8.9-inch Fire HD, you want to keep on holding it and turning it over and sweeping your hands across the back and screen and sides. Overall, Amazon's Kindle OS is a reasonable way to dig through and guzzle media. But compared to iOS and stock Android, it can get chaotic and downright maddening. Amazon's carousel is an awkward workaround to the traditional home screen, and can easily transform into unwelcome clutter. Everything you open (apps, movies, books, comics and more) is suddenly there, in your face. That might be nice if you frequently watch or play or listen to one specific thing, but the OS is constantly putting stuff there for you, whether you want it there or not. You can delete stuff from the carousel, but it becomes time consuming if you're constantly doing so. There's not much flexibility — this is Android, so there should be — unless you count the Favorites drawer that pops up. The lack of multitasking is a wild omission in this stage of the game. While Amazon's media ecosystem is among the best, the company's Appstore is still not quite on the same level of a Google Play or Apple App Store. I'm not a particularly heavy app user, so it wasn't a major issue for me — I occasionally play games and use Netflix — but it might irk some folks. I think, for the most part, Amazon's extensive media experience balances out the lack of some apps. This aspect will really vary from user to user. Someone who picks up a Fire HD to play Angry Birds and watch some videos obviously won't be disappointed. Amazon tucked some respectable guts inside the 8.9, and the inclusion of Ice Cream Sandwich is certainly welcome. But holy wow, there's lag present everywhere, and often times it appears when doing the simplest of tasks. It takes apps quite a long time to open, and many times I even ran into problems of apps not opening at all. In particular, Fruit Ninja would load endlessly — OpenFeint seemed to be a major culprit — causing me to just jump back to the home screen. When things do decide to open, they open, and they run smooth enough. I had no trouble with HD movies or TV shows, and reading books and comics is clean and smooth. Unfortunately, there's stutter jumping into menus, navigating through stores (sometimes items wouldn't load, even on an exemplary connection) and bringing up the keyboard. Typing in the Web browser, for example, is slow — you really have to type deliberately, letter by letter, otherwise the device doesn't always keep up. It's little things like that that makes the experience frustrating, especially compared to the Nexus 7 or iPad. Amazon has gone to great lengths to hide the face of Android in an effort to make content king, but it's obvious things still need a lot of work. There's really no fussing about with how you control the OS, which is Amazon's goal, and probably a good thing for the average consumer. But under all the software forking some wires seemed to have been crossed or disconnected, leading to a sometimes sluggish experience. Look, as a service, a focused window into Amazon's ecosystem, it's an absolute winner. The Kindle Fire HD is an exemplary example of Amazon's ability to provide consumers with a vehicle in which to watch and look and listen; it's a media vending machine. The size and design is wonderful, even if the OS lacks the shine and polish of stock Android or iOS. If you prefer to hunker down every night to watch a movie or TV show, the Kindle Fire HD 8.9 provides an excellent experience that's beautifully integrated into a robust ecosystem. At $300, the value is there. However, this isn't a device that can charge you through the day and actually help you create content. You won't whip this out to power through tons of email or shoot off important documents. Those aspects seem like afterthoughts, and you have to think Amazon designed it to be that way. That's fine. But on those merits, it's definitely not as strong as an iPad or Nexus 7 (I'd assume it's definitely not as good as a Nexus 10, too, but I have yet to play with that).